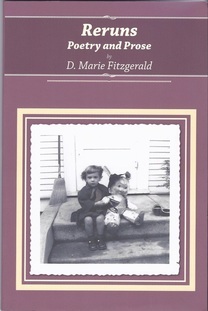 Just as one associates a rerun with a television episode that is repeated for our viewing pleasure, D. Marie Fitzgerald has selected episodes drawn from her life, transforming and adapting those episodes into short story, memoir, and poetry. In this collection she replays relationships with family, lovers, and herself. Reruns gathers together poetry and prose that is confessional, sometimes cryptic, and promisingly provocative. Paperback editions available through Amazon and Barnes and Noble.com. Reviews on Amazon are most welcome.